The Canadian government has been in constant conflict with the Indigenous Peoples of Canada for centuries. They continue this conflict today. You can see it clearly if you just take a moment to look. Reservations starved of financial resources in order to impoverish and pacify the population. No money means substandard education, lack of proper health care, and a desperation that leads to capitulation when it comes to agreeing to resource extraction on Reserve and unceded land. There is rarely any media or governmental reporting that would indicate that Indigenous people have any legal, moral or historical right or ground to stand on. Their concerns are never given due respect or consideration. In some newspapers, there is an unvarnished and openly racist attitude toward the First Peoples. In the 21st century, in a first world country, many First Nations are still condemned to living in 3rd world conditions. No plumbing, no clean water, inadequate housing, and so on. Add to the list the generations of Residential School horror, the abuse, both physically and sexually, the attempted genocide of culture and populations, the medical experimentation…it is a virtual abattoir of Canadian History. The Government’s propaganda machine has been so effective that we don’t teach all this in schools and the general population has no understanding or respect for Canada’s founding documents, the Treaties. They only know the most vile and racist disinformation and propagate it as truth. They literally don’t know any better! Now, what’s it all about? If it’s about money (and it is), then hit them where it hurts. By occupying traditional lands, standing in the road so that the trucks can’t pass. Relearning and sharing language and culture. Get educated. Learn the system and become better at it than those who are invested in it. Gather allies from the vast non-Indigenous population of Canada who are aware of the injustice and inequality a dishonourable government has perpetuated. All those ideas are good ideas. They are workable. They serve to keep the issues in the media spotlight and further serve to embarrass the government. Here’s where it gets dicey, though. As we saw most recently in Elsipogtog, things can get violent. In this recent situation, it was obvious the violence was initiated by the government. They shot rubber bullets at the mothers and the grandmothers, at the children. The men tried to protect them and the day ended in 6 burning cars and what do you think got the headlines? The rubber bullets? The RCMP, the Canadian Armed Forces, US Delta Forces, all gathered in a ridiculous show of force against a people who were trying to protect the water for you and yours? The media war that day was lost. Most Canadians saw the masked Indigenous man with arm upraised in front of burning cars and guess what? It triggered their fear response. Retaliation doesn’t work. It just doesn’t. All it does is reinforce long held, likely subconscious, negative attitudes toward Indigenous people. For there to be change, there must be a sense of shame. If on that day, the warriors protected the women and children with their bodies and DID NOT retaliate, there would have been disgust at the government. Some eyes would be opened, and the Indigenous people of Canada would have gained more allies. But that’s asking for a very deep and remarkable type of strength from a man who is watching his loved ones hurting. Blockades are both effective and valid forms of stopping development. As long as there are no weapons present, the moral high ground is assured. In the case of fracking and Elsipogtog, more and more countries are banning fracking altogether. There is growing international support for issues that align with our own. But once the macho culture takes over and the rifles are brandished then government now has an excuse to say that their actions were for public safety. Who is going to disagree? Not very many voters. And that’s who you need to disagree. Blockades in cities don’t do anything constructive. It won’t bring an economy to it’s knees, it just annoys the hell out of people and makes them angry. Turns out, when you bring an economy of neighbours to their knees, they’re not really in the mood to support you. This is where it gets just plain nutty. The idea that a rag tag group of Indigenous people can take direct action against a government using arms – and win. Basic math says this is impossible. And guns. I don’t care what training you have, a bullet is faster than a body. Every time. Those who advocate for this are likely never going to volunteer for the front lines. To win this Cold War, we have to warm the hearts of our neighbours. We have to make friends with every non-Indigenous person we can. That is what Idle No More is so good at. People scoffed at the Round Dances, the drums, the songs. They felt it was a waste of an opportunity. If you were going to galvanize a people, why not direct them to taking direct action as well, to disrupt the system? Well, there’s two flaws to that thinking. The first is that all those people wouldn’t have gathered under a different banner/philosophy in the first place. It was the fact that women lead us and they had a welcoming philosophy of Peace and Friendship that made the People want to join. The second flaw is in thinking that it was ineffective. Idle No More is so effective the Government had no idea what to do. Their internal documents betray their fear and confusion. You see, they can’t fight an enemy if there isn’t one! If your so-called enemy is holding hands with the people you consider your own, how can you fight them? 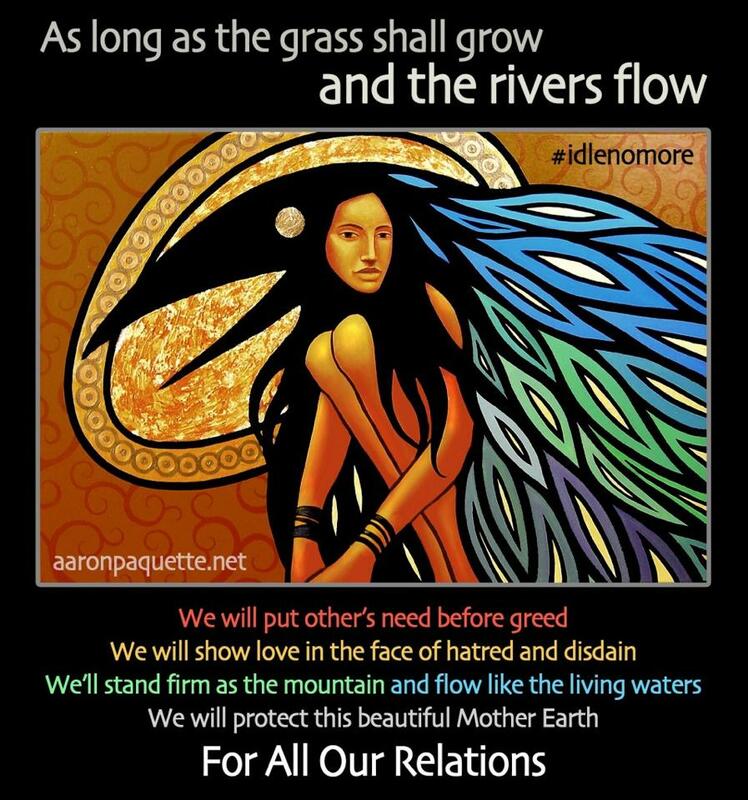 Idle No More makes allies, raises the conversation, opens eyes and began a continuing effort to educate and bring more and more people into the fold. As people learned more about what is REALLY happening in this country in regard to water, development and resources, they became Allies. The Government begins losing the Propaganda war to Truth. We gain the moral high ground. This is the age of social media and instant communication. Moral High Ground is everything. People want to be on the right side of history and most will not tolerate atrocity in their name once they are made aware of it. This is why I advocate a philosophy of non-violence, friendship and education. I believe most people are good. And they haven’t proven me wrong yet. This is why I believe in education, organization, action and strategy. Violence is a tool of last resort. Once you unleash it, you unleash a host of sicknesses. Just because the Government is violent toward us does not mean they are winning or that we are weak. It means they are using the last card in their deck, and unwisely. It means we are stronger than we think. To meet violence with violence means everyone loses. Period. But the party with the most guns wins their Pyrrhic victory – and their development money. We just get more of our men and women thrown in jail. We need friends. We need voting friends. We need voting friends who will stand with us and help share our message. That’s what we need. We depend on shame to compel the government to do the right thing – as it is obvious common decency isn’t doing the trick. Ironically, those who would engage in retaliation depend on the exact same thing. When going up against a thousand guns, you pray for a little restraint, after all. And if shame doesn’t work, you vote the bums out. Long term, it would be beautiful to see our young people go into politics (but manage to stay free of political groupthink). I don’t know if that’s possible, but a part of me thinks it is. First consider how much damage is done to the soul of a people who causes that much harm. The fact is, we have to heal together. We have to walk side by side. If war solved things, we’d be living in a global paradise right now. It’s obvious we need a new way to approach our differences, a new way to ensure fairness, justice and peace for our future generations. It only happens if enough people join in. And that takes deep strength. It takes faith and trust in the Creator and in the person next to you. We have all inherited this toxic sickness of greed and emptiness that seems to rule the rulers of this world. We begin to buy into it. To decolonize means to turn away from that way of living and to honour your own roots, culture and philosophies. And it’s open to everyone regardless of race, colour or creed. Decolonization is essential for the Indigenous People and allies of this land, even if it’s only the first steps. This is how we break the harmful patterns and ideologies into which we were born. We are the people of the hoop. We can stop the cycle. Redirect it. We can honour All Our Relations. We can be the warriors this world needs.